Why are there chemicals in fresh chicken? Did it ever occur to you that there might be chemicals added to fresh chicken? no? Me neither! I don't always pay attention to ingredients lists in the grocery store. Especially in things that really shouldn't have much on the list. Like chicken. See where it says **CHICKEN BROTH INGREDIENTS: ? Now I don't really think that chicken broth can be an ingredient in chicken broth...after all ingredients are generally single items combined to form a more complex item and if it has it's own ingredient list...oh never mind, I'm sure you get it! Further down on that list is something called Carrageenan. Maybe this explains it, after all I have no idea what Carrageenan is....so off to Wikipedia I go for a definition. Carrageenans or carrageenins are a family of linear sulfated polysaccharides that are extracted from red seaweeds. Polysaccharides are long carbohydrate molecules of repeated monomer units joined together by glycosidic bonds. Apparently I can follow links all day and get no closer to actually understanding WTH is in my chicken! I don't have a degree in science. I'm not a chemist. I don't get it! I did find this blog that explained it to me a little better Carrageenan: a food additive that's not as safe as you think. This all comes down to: I just want to know why the chicken I'm feeding my family is anything more then chicken? What gives them the right to put this stuff in my food and not have a HUGE notation of it on the label? (can they possibly make it harder to read that small print?) Why on earth do I need chicken to be fresh for more then a week? Oh right....so those companies who's names I blacked out would make more money. My bad. You may have noticed that we don't sell meat birds at our hatchery. I don't think that will change. I'm not a fan of raising meaties for myself, though I will butcher a problem rooster if need be! I'm not saying you have to 'butcher your own' or anything like that. I'm just pointing out that something many of us take for granted "fresh chicken is just chicken" may not be. I visited the same store again and found fresh chicken without the additives for an extra $1 a lb, but it was just chicken. Now I will point out again that I'm not a chemist or anything even close so if I misunderstood these ingredients please feel free to let me know. Honestly, I'm hoping somebody can prove me wrong! I will be happy to correct or remove this blog. Here's how it looks to me: companies add things to food to keep them fresher longer and keep the cost down. Those who cannot afford to spend more for the same foods end up consuming larger quantities of questionable ingredients which may or may not cause health problems. hmmm. At the very least I think they need a bigger warning and really, if the rest of the label is in both English and Spanish, why not the ingredient list? That just smacks of rudeness to me! What do you think? Should things like this be added to "fresh" chicken? Should there be more of a warning on the package? Actually, this isn't the worst of it. They don't have to tell you that most chicken also goes through a bath water with possible additions such as formaldehyde and chlorine after disemboweling. Plus, they are now admitting that arsenic is added to the chicken feed to make the meat look more appetizing to the consumer. Sorry I can't make you feel better about buying chicken from the store. I now only eat chicken that I raise and butcher myself. I'm not super crazy about buying the Cornish x either, but at least I know what they are eating and what goes in the final product. Thanks for sharing on The Creative HomeAcre! OMG really?? Ugh! This was just a quick rant I posted to my other blog back in November, but thought it would be of interest to my readers here. Since then I've started going to the butcher shop down the road much more often. He raises all his own chicken and beef. It might be pricier but it's sooo worth the peace of mind. I'm also guilty of letting extra roosters grow out a bit and butchering them myself. They live a much happier life then a store meat chicken I'm sure...then meet a super swift end. Thanks for the comment! I love your blog hop! 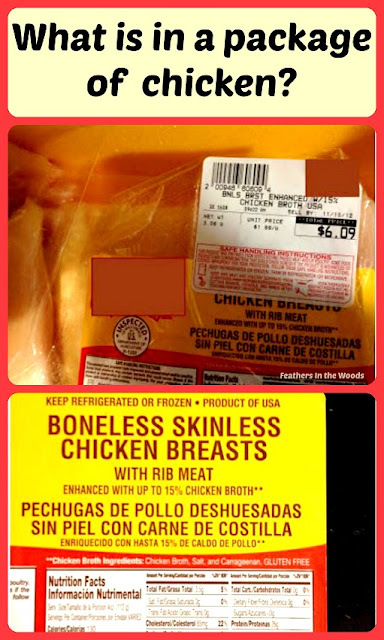 It is a shocker to read the food label on what should be ONLY chicken. I won't eat my own chickens either but I do pay the extra price to buy Fresh chicken from my natural food store to get healthy chicken without the added chemicals. It is sad that those who can't afford the better quality food usually are those who need it the most. I make a point of supplying my grandkids with quality foods for their freezer as often as I can. You know, it truly scares me that they are allowed to do this kind of stuff to our foods. I don't think they should be allowed to do anything to our food that they don't disclose. My son is allergic to blue dye....what if that was added to something? Scary, right? Margarine has freaked me out for awhile now. I didn't know that's why it was invented, I did know that its almost pure chemicals. Wonder what that does to our systems...besides making us fat?